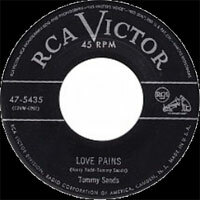 Chanteur US né le 27 Août 1937 à Chicago (Illinois), Tommy Sands n'avait pas plus de 20 ans lorsque NBC l'engagea pour être la vedette de l'émission "The Singing Idol",. Tommy fut l'époux de Nancy Sinatra pendant cinq ans et il avait débuté à 12 ans comme Disc-Jockey dans une station de radio de Houston (Texas). Il fut considéré comme un chanteur de Rock 'n' Roll pour son album "Sands Storm" qui dégageait de l'énergie avec ses versions de "Maybellene, Hey Miss Fanny, Such A Night, etc...". 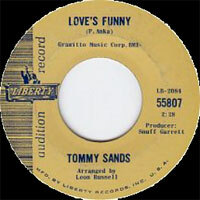 Il avait le même producteur, Ken Nelson, que Gene Vincent et Wanda Jackson et a enregistré chez Capitol Records. 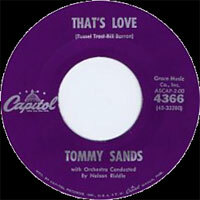 The multi-talented Tommy Sands was born August 27, 1937, in Chicago, IL, to show-business parents. His entry into the business was no mistake, surprise, or happenstance, but genetic and inevitable. His father played piano and his mother sang. He took guitar lessons when he was eight years old and became an adequate axeman. By this time the Sands had moved to Houston, TX, where Sands got the acting bug. He moved to Los Angeles after high school and landed a job on Cliffie Stone's country & western television show. The exposure led to regular appearances on Tennessee Ernie Ford's weekly televison program and nightclub gigs. 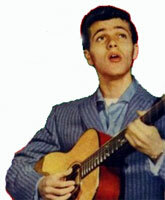 He got a big break in 1957 when he got the lead role in The Singin' Idol, a television drama on rock & roll. 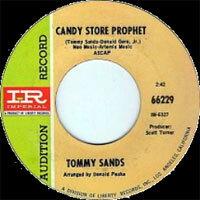 The producer's first choice was Elvis Presley but he wasn't available, so a search went on and Sands won. 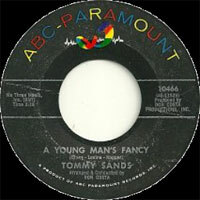 A single from the show Teenage Crush on Capitol Records went to number two on Billboard's pop chart and Sands became an overnight sensation. He appeared on many Kraft Theater shows and nearly every network variety show on television. No one-hit wonder, he also hit the charts with "Goin' Steady," "The Worryin' Kind," "Blue Ribbon Baby," "Sing Boy Sing," "The Old Oaken Bucket," and "The Parent Trap." 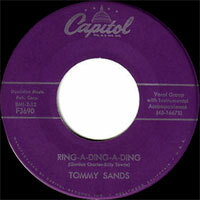 The release of "I'll Be Seeing You," marked a new musical direction for Sands. 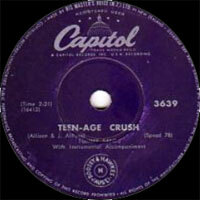 He cut two albums with Nelson Riddle and continue to release singles for a variety of labels, but none in the teen rock format that made him famous. From the late '50s to the '70s he appeared in more than 150 television programs, and many movies including Sing Boy Sing (his first), Babes in Toyland, The Longest Day, Ensign Pulver, None but the Brave, Mardi Gras, and The Violent One. 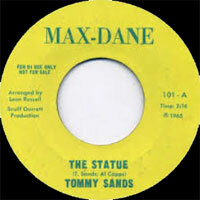 He married Nancy Sinatra in 1960; the union lasted five years. Where is he now? Still performing and thrilling fans all over the world. What else? It's in his genes. 1951 78 t. & SP FREEDOM 5022 (US) . 08/1953 SP RCA VICTOR 47-5435 (US) . 12/1953 SP RCA VICTOR 47-5510 (US) . 02/1954 SP RCA VICTOR 47-5628 (US) . 04/1954 SP RCA VICTOR 47-5697 (US) . 07/1954 SP RCA VICTOR 47-5800 (US) . 09/1954 SP RCA VICTOR 47-5860 (US) . 02/1955 SP RCA VICTOR 47-6007 (US) . 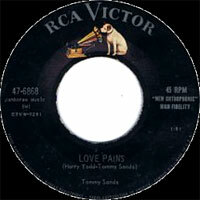 03/1957 SP RCA VICTOR 47-6868 (US) . 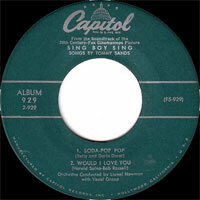 05/1961 SP CAPITOL 4580 (US) . 09/1963 SP ABC-PARAMOUNT 45-10480 (US) . 03/1964 SP ABC-PARAMOUNT 45-10539 (US) . 08/1964 SP ABC-PARAMOUNT 45-10591 (US) . 06/1965 SP LIBERTY 55807 (US) . 10/1965 SP LIBERTY 55842 (US) . 05/1966 SP IMPERIAL 66174 (US) . 02/1967 SP IMPERIAL 66229 (US) . 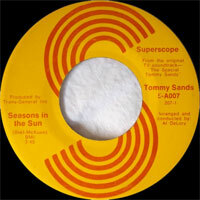 08/1969 SP Superscope 5-A007 (US) .